Google offers many automatic answers. Ask it to add or multiply and it will. Ask for a current exchange rate and it will tell you. Put in any flight number and it will automatically show you if it is on time. 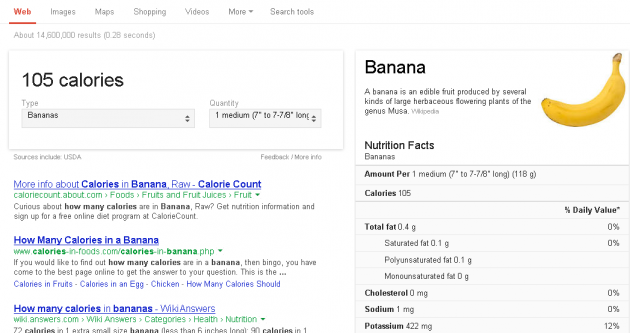 Now, in line with the world's increasing interest in health, the search engine is automatically showing users nutritional and calorie information for thousands of 000 fruits, vegetables, meats and meals. Ask "how many calories are in an apple" or "how much saturated fat is in an egg" and it will automatically show you the answer. The tool works on mobile devices using Google Voice Search too.